Tuna is the name for the fruit of the pickly pear cactus!! 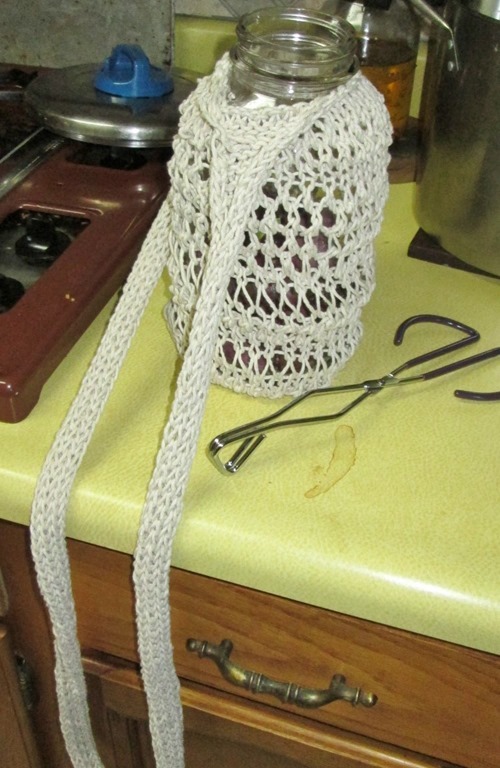 knit this little sling out of cotton twine for carrying the glass jar. Used to use a plastic bag, but that was so wasteful. A wide mouth jar would be better, but this narrow mouth 1.5 liter jar was what I had. Tongs are used to harvest as well as hold while burning off the spines. 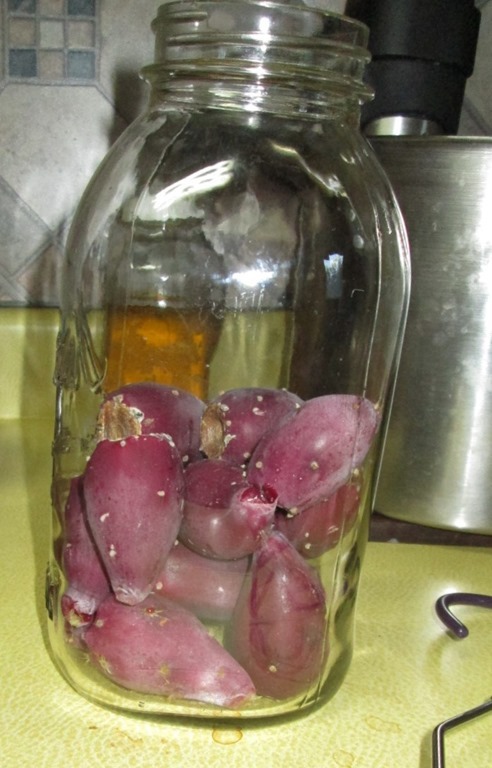 Yes, this fruit has spines, it IS prickly pear!! Not a big harvest, but there is more fruit ripening. We lost a lot of our plants during the drought, but a couple of years of rain is bringing some of them back. Those that are producing, are producing well. Still won’t be a BIG harvest, but better than the NO harvest of the past 5 or so years!! spines are small, but nasty. You often don’t even see them, until you see them sparkle as they burn away. But try to pick this fruit with your bare hands and you will find out how nasty they can be! There are lots of other ways of dealing with the spines. When I read about how the native peoples dealt with it, it was like DUH! how easy! had tried all the other ways, and every one of them left nasty little spines in the fruit, in the juice, in my fingers, on my cutting board, clothes, etc. The flames handle them and its done! The roasting also helps bring out the juice. Prickly pear is a pretty juice. Since I don’t like to add sugar and pectins, usually mix with apple to make fruit leathers or an apple/tuna butter spread. It will depend on just how much juice I get this year. This entry was posted in canning, fruit, homesteading, organic, prepping, preserving, recipes, self-reliance, Uncategorized, wild harvest. Bookmark the permalink. This is great! 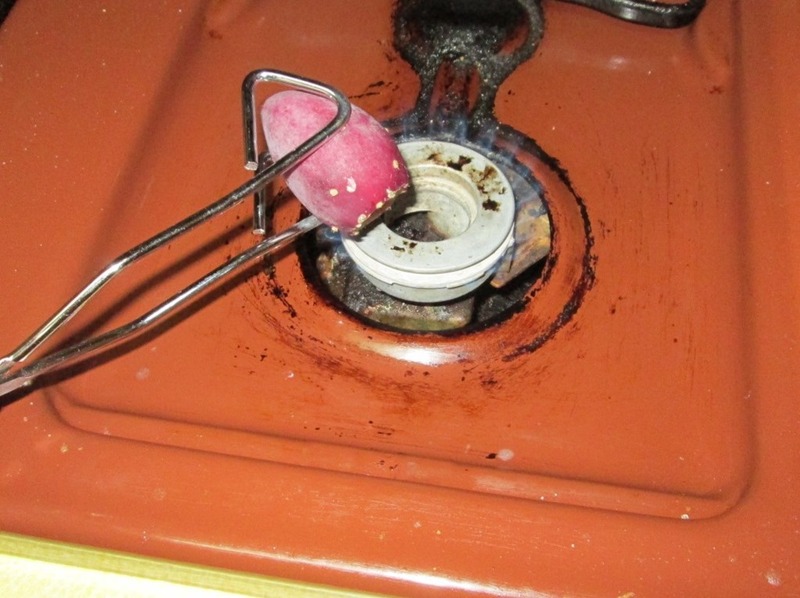 Thanks for sharing your tricks – I’m going to have to put roasting tongs on my list! 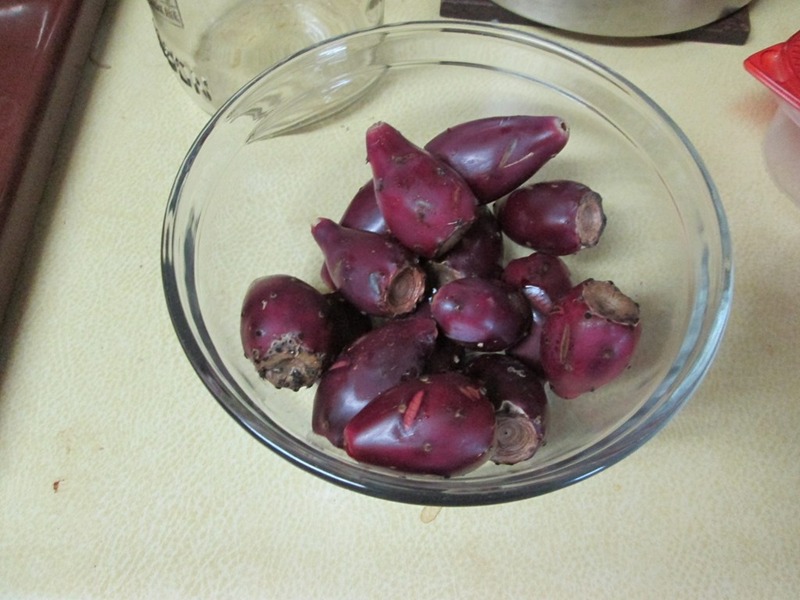 We do have prickly pear in northern NC – hoping for a harvest in one or two years. depending on size and quantity, you can also try just rolling them over hot coals, which is how the Indians would have dealt with the spines. you still need tongs to pick them though, the Indians used wooden ones, we get the option of commercial metal ones.